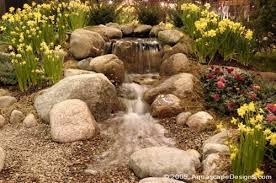 A Pondless Waterfall is simply a waterfall without the pond. The perfect solution for small spaces or family homes with small children. This is also the ideal water feature for the front of the home since it can be tucked into any corner. Children will spend hours playing in and around this system. 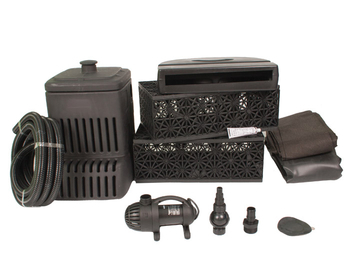 This kit contains all necessary components to create your 4' x 6' Pondless Waterfall with a small 3' long waterfall/stream. Pondless Waterfall Vault - Provides access to your pump and allows you to check the water level in the system. (2) Small AquaBlox - provides water storage for reservoir. 25 feet of 1.5" quality kink-free hose. 10' x 12' Pond Liner made of 45 mil, EPDM Fish-safe rubber. Welcome Kit - printed material, USB manual, video and instructions. The water held within the open spaces of the gravel and AquaBlox flows down toward the Pondless Waterfall Vault. From there, it gets pumped up to the Waterfall Spillway, where it flows by gravity back down through the gravel bed and the cycle begins again.